When it comes to fragrances I am very picky, most fragrances give me an aching head and so I tend to stay away from the lot of them. I stick to the fragrances that I know I can handle, cedar wood, light vanilla scents, light lavender scents and any scent that is considered light and woody are the type of scents I tend to be drawn to. Anything too floral and too strong smelling are definite nos. 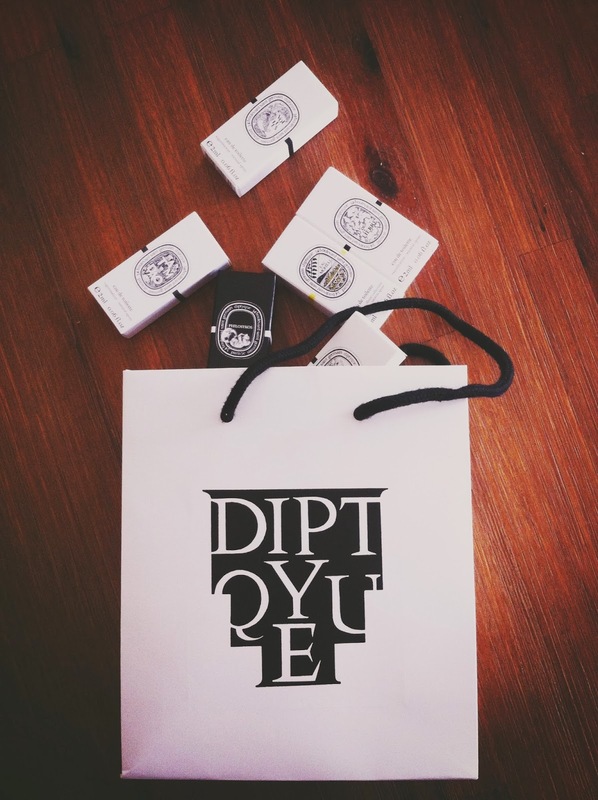 Recently a new store opened up in town, a store called Diptyque, a fancy french store that sells fancy scented candles, diffusers, perfume and de toilettes. A small candle costs about $28 while a large candle costs $60. So when I say "fancy" I mean "faaaaancy". I get my usual diffuser at a beauty store for $20, the diffuser lasts for quite a while, well over 6 months has been my experience- and so while $20 is, for me, quite expensive for keeping my bathroom smelling nice it is still worth the price when considering how long it lasts. So having spent $20 on diffusers in the past I decided to get a small candle ($28) to simply try it out. The selling point that worked on me? Scents such as "fireplace" and "fig", that's right, a candle that smells like you've got the fireplace going in your home, or the "fig" scent that smells like my fig tree in the backyard during fig season. The small candles probably will not last even close to 6 months but maybe the scent will turn me on to regularly spending $28 or $60, I suppose we'll see in not too long if Diptyque candles will make the cut, as for now... Here's to trying something new.